Leading marketing scientists, with an MS/OR orientation, present in this book a state-of-the-art review of their area of expertise. The wide range of material spans the marketing discipline and represents coverage of both what is known and what problem areas present themselves as ripe for further development. The articles are written with a technically sophisticated reader in mind, but not necessarily an expert in marketing. The authors provide a discussion of the motivation - the behavioural foundations or key assumptions - leading to the development of the important models or methods in each area. 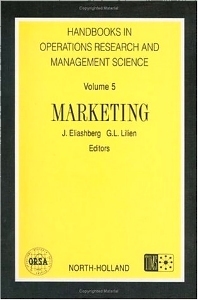 While not primarily a text, the book provides a foundation for advanced students in marketing. MS/OR professionals, both academic and practitioner alike, will appreciate the impact that the MS/OR approach has had in the marketing area. Finally, the book provides useful reading for marketing scientists, academics and practitioners who want access to integrated treatments of the most important topics in their field.